The wellness-inspired hotel chain, Fusion, has held a breaking-ground ceremony for Fusion Suites Vung Tau, the first in Vietnam to use tubular slides to carry guests between floors. The project is scheduled for completion in the third quarter of 2019. 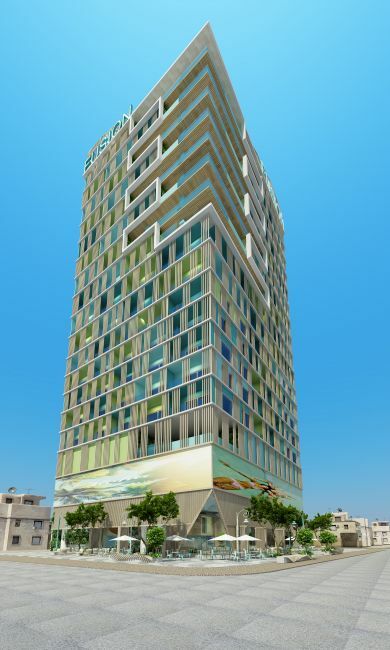 The “all-suite” hotel will be located in the heart of Vung Tau city, at the intersection of Truong Cong Dinh, Phan Boi Chau, and Nguyen Cong Tru Streets, placing it within easy reach of all major tourist attractions and key sites such as Bai Truoc Park, the cultural center, Vung Tau Lighthouse, and the Ho Chi Minh City - Vung Tau express ferry port. Designed for the modern traveler, Fusion Suites Vung Tau will provide a range of 171 unique and well-appointed suites and apartments, perfect for young families, couples, or groups of friends. Featuring expansive windows, the 20-story property will make full use of the breathtaking ocean views and natural light that the dynamic coastal city is famous for. As well as the unique slide system, the property will also include functional areas and guest facilities, including an onsite spa, a rooftop infinity pool and cocktail bar, a refined yet informal restaurant serving yet another healthy, balanced and creative Fusion menu, plus a coffee lounge, meeting room, and conference facilities. The project will also bring a high level of service to Vietnam’s rapidly developing tourism sector, aimed at attracting domestic and foreign tourists alike. HODECO, Fusion’s partner in the project, was chosen in light of their proven expertise in construction. This is the first time HODECO has worked on a property for the hospitality industry, but, as they have shown throughout all previous projects, their professionalism marks them as a leading company in the real estate market in Ba Ria Vung Tau province. Vung Tau welcomes over 15 million international and domestic travelers each year, making hospitality one of the fastest-growing sectors in the city. With the breaking-ground ceremony for Fusion Suites Vung Tau, the company aims to bring Fusion’s exciting signature concepts and wellness-inspired initiatives to the natural beauty of Vung Tau’s coastline. Since its launch in 2008, Fusion has become a leading innovator of wellness-inspired hotels and resorts, and is now the only fully vertically integrated hospitality company in Southeast Asia. It has opened six resorts and hotels in Vietnam so far, with a team of more than 1,500 employees, including 300 spa specialists.